The grey trend, like every trend, is a reflection of what is happening in the world, socially, economically, politically and with the environment. It is the result of the human psyche adapting to the current circumstances of the time. This is reflected through history of design in both fashion and interiors. Trends develop as a result of the current circumstances of the time. Life changing events around the world influence the eventual conception and development of trends. For example, there is a term in interiors called ‘ cocooning’, It was coined by a highly influential trend forecaster in the eighties who saw a need in people to make their homes a place of sanctuary, where they could retreat to take a break for the world for a while at the end of their day. A recent recognizable macro trend (which developed as a result of the most recent recession) was the modern Shabby Chic / Vintage Chic trend. The economic climate was looking very bleak and people were seeking for more affordable ways to decorate. Most people could no longer afford to redecorate or hire professional painters as often as they did before. So the ‘make do and mend’ mindset and the nostalgia of days gone by when previous generations had to make do and mend came to the fore. The trend was recognisable by Laura Ashley and Kath Kidston style colours and patterns, chalk painted boot sale purchased furniture, lots of white and pretty pastels, distressing and retro style wall hangings with inspirational and motivational quotes printed on them. Why is grey still as popular as a trend here in Ireland? 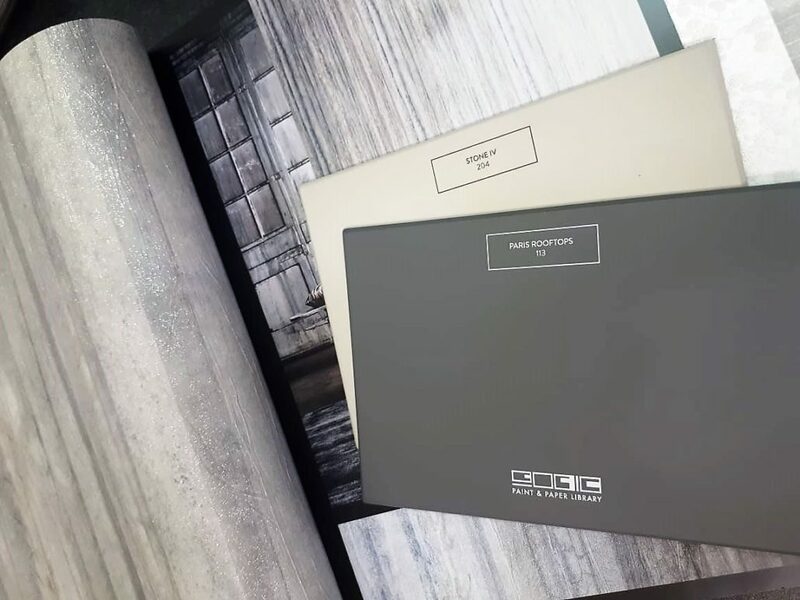 The popularity of grey as a neutral is linked with the rise of two other huge interior trends, Scandinavian style and Modern Industrial style. Scandinavian style design is influenced by a connection to nature, combining natural shapes and materials with abstract. Modern industrial style feels environmentally friendly with many reclaimed materials and a pared back look encouraging the ‘Reduce, Reuse, Recycle’ way of life. The three trends combined, appeal to the current need the world is expressing, for self-care and care for the environment. The wish to get back to basics , remove excess and stress and simplify life, while looking after the planet for future generations. There are many subtle notes of other colours in a collection of about 500 shades of grey which gives each grey its own unique feel. Versatility is key to grey being popular as a neutral, it is more difficult to mix colors with beige or magnolia because they have yellow undertones. This is why grey has taken over as the new neutral. Because there is a shade of grey that can communicate any emotion, its versatility means that each space can tell a different story from dramatic and moody to soft and airy. Grey itself can also be used as a statement shade in any room, Greys as neutrals go well bolder shades just as much as softer hues. Grey can take on a unique feel depending on what it’s paired with which leads to limitless options to ensure no room is the same as another. Though grey is perceived as a neutral it is a colour that is greatly influenced by its undertones and its place on the temperature scale. Grey with blue/green undertones is calming but cool. Grey with red/yellow undertones are warming but can often look beigey the higher up the temperature scale you go. Consider the effect you want to achieve on the room where you are decorating with grey. Calming can work well in bedrooms and bathrooms in southwest facing positions where more sunlight is present. Warm greys can work well in cool north east facing rooms or living areas where you want to feel cosy and welcome. If all grey on grey seems too boring for you, consider bringing in shots of colour with soft furnishings, ornaments, lamps and rugs or a feature wall which can be easier and less expensive to replace when a fresh look is desired. This can be done softly with pastels like blush or dramatically with jewel tones like deep yellow, teal or red. Deep greys make a dramatic statement while light greys are on the airier side in a setting. But mixing both is a great way of also creating drama in both traditional and contemporary style décor. If you would like to know more about please get in touch with Sharon at Colorworks, Just click this link!